Decorate your home with a bright spring bouquet made with colorful scrapbook papers. This is a guide about making a scrapbook paper flower bouquet. The spring colors of this bouquet will brighten up a wintry day and bring a little sunshine into someone's home. 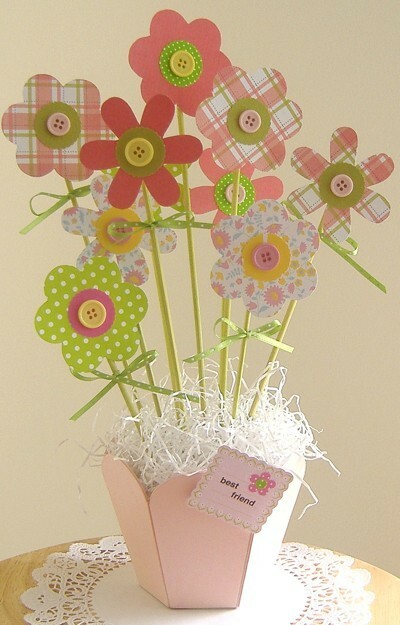 Scrapbook papers, pink textured cardstock and painted bamboo skewers were used to create this bouquet. Protect work area with newspapers. Spray paint petal pot pink and allow to dry. Paint bamboo skewers green. Allow to dry. 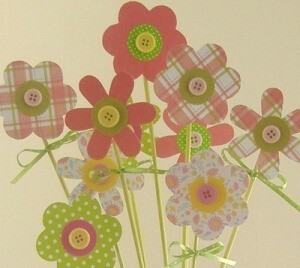 Cut as many flowers as you require from pink cardstock and scrapbook papers using the chipboard flowers as template. Use 1 inch scallop circle punch, to punch circle shapes from cardstock (green and pink) and scrapbook papers. Glue circle paper at the center of each flower. Center a button on each flower with a dot of hot glue. Cut various sizes of bamboo skewer. Use hot glue or double-sided tape to adhere paper flowers to one side of the bamboo skewer. Note: You can add two flowers on each piece of skewer (front and back). Then tie ribbon bow around bamboo skewer. Cut floral foam to fit into petal pot. Adhere it to the center bottom of pot with a hot glue. Stick bamboo skewer (with paper flowers) into foam. Arrange paper shreds to cover foam. 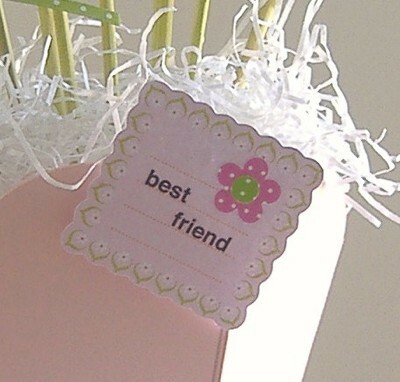 Attach a personalized tag with small foam adhesive. I love this. It looks cute enough to brighten any corner for Easter. Thanks.